There are various ways to travel from Tokyo to Osaka such as the Shinkansen, highway bus and airline. Read on to learn about the pros and cons of each route. Tokyo and Osaka are gateways to Japan, with international airports located nearby. Some tourists may even visit both cities. But the two cities are not neighbors, and traveling from one city to the other takes time and costs money. This article is about the the various routes between Tokyo and Osaka, with comparisons of the time and cost. Read on to find the best solution for you. The shinkansen (bullet train) is the most convenient way to travel from Tokyo to Osaka. It offers a smooth and comfortable ride, along with the shortest travel time, compared to other routes. 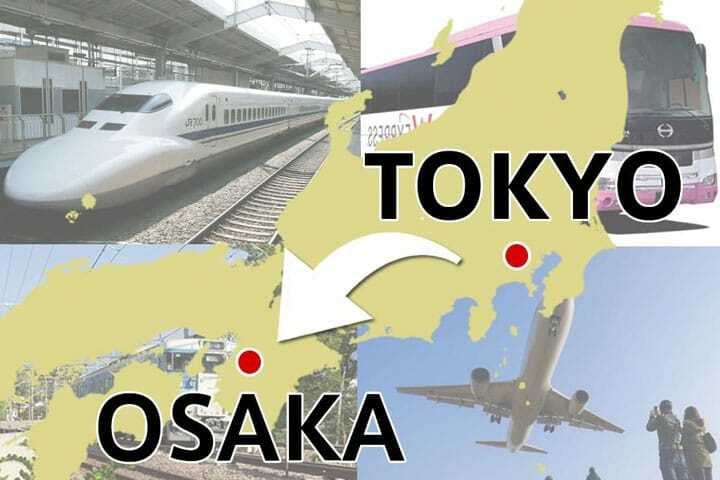 To reach Osaka, board the Tokaido Shinkansen from Tokyo Station and get off at Shin-Osaka Station. Tokaido Shinkansen offers three types (Nozomi, Hikari and Kodama), and they all stop at Shin-Osaka Station. Nozomi is the fastest, as the ride to Osaka takes about two and a half hours. Hikari takes about three hours, and Kodama takes about four. Japan Rail Pass, also mentioned in this article, can be used only on Hikari and Kodama. Shin-Osaka Station is only one station away form JR Osaka Station. It is also a fifteen-minute ride away on the subway from Shinsaibashi Station and Nanba Station, both of which are close to Dotonbori, a famous sightseeing spot. Travel Time: About two and a half hours on the Nozomi. Those who plan to visit other cities besides Tokyo and Osaka should consider the Japan Rail Pass, which enables the user to ride JR trains and shinkansen. For more information on eligibility and purchasing instructions, please take a look at this article: Tailor-Made Holidays In Japan With Japan Rail Pass. From: Japan Bus Pass: Unlimited Rides on High-Way Buses Around Japan! If you want to save transportation costs, use the highway bus. The bus fare may be low as 3000 to 4000 yen, although it depends on the season and the bus company. The average fare is 6000 to 10,000 yen. The travel time will be about eight to nine hours, but by using the night bus, which departs in evening, passengers will be able to sleep during the ride. Buses may be fully booked in some seasons, so it would be better to make a reservation in advance. Visitors from abroad should take a look at Japan Bus Pass, a special ticket which allows the user to ride multiple highway buses and move around various cities. Travel Time: Eight to nine hours. There are daily flights from Narita/Haneda Airport near Tokyo, to Kansai International/Itami Airport near Osaka. The departure and arrival will depend on the airline company and the flight. This is the fastest way to travel, as the flight takes about an hour and a half. One-way tickets cost about 12000 yen to 20000 yen, but some low-cost carriers offer tickets from 5000 to 10000 yen. The fare will vary according to airlines and the season, so an early reservation is recommended. Travel time: About an hour and a half. Pro: This is the fastest way to travel. Con: Some airports are located away from urban areas. For example, it will take about an hour from Tokyo Station to Narita Airport, either by bus or train. If you plan to leisurely visit local cities in Japan, purchase the Seishun 18 Kippu. This ticket allows users to ride on non-reserved seats of JR local/rapid trains all over Japan, with the freedom to get on and off freely. An additional fare will be charged to ride the limited express. You will be able to visit sightseeing spots such as Hakone or Nagoya on your way to Osaka. This ticket is recommended to those who want to enjoy the scenery during the ride, or travel without planning in advance. Please be aware that this ticket is sold only three times a year, and the term of validity is limited. There are various ways to travel from Tokyo to Osaka. Choose a route that fits your itinerary and budget, and enjoy your trip. ** This article is a revised 2018 version of the original, published on December 3, 2015.